On October 9, 2006, SACMS had its first educational events of the season. 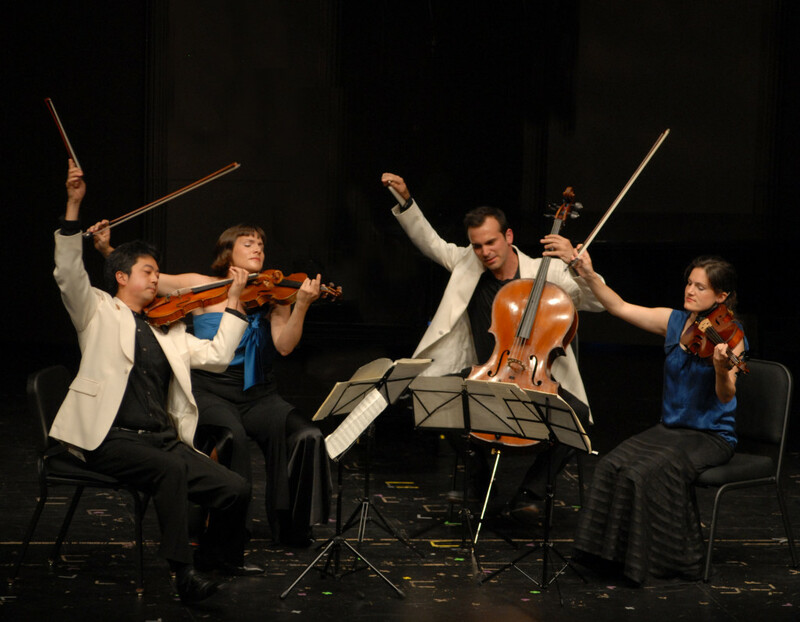 The Jupiter Quartet performed two classroom concerts at Trinity University for non-music major students. These students who are studying music history with Dr. Carl Leafstedt represent future audiences for live classical music performances. The impact of the performance/lecture could be discerned when a question was asked about the “goose bump” factor of music. Why does music sometimes give us goose bumps, and how do performers deal with the stress of both committing and surrendering emotionally in order to evoke a response from the audience? When the question was asked one of the students volunteered “yeah, my heart is pounding”! In the afternoon we had quite a different experience in a completely untraditional setting – that of the Bexar County Juvenile Detention Center. The quartet unpacked their instruments in a gymnasium devoid of any accoutrements other than 10 rows of hard, indestructible, plastic chairs. The adolescents were led into the gym in single file, hands behind their backs, and seated amidst a palpable silence. Daniel McDonough, cellist, spoke to the audience explaining the music that they were about to hear. (The group played the entire Shostakovich String Quartet No. 8, which they performed on our series on the preceding Sunday.) He spoke of the feelings of violence and anger described in the music. One section was characterized as sounding like gunshots. The audience was rapt and attentive, and sat quietly throughout the entire 25 minute piece. The music was accompanied by the eerie sound of key chains rattling as guards walked around the room. It is our hope that as these children go back out into society, they will remember that someone took the time to share something precious and invaluable with them.